Turn your outdoor area into a summer oasis with the addition of a modern outdoor shade sail from Everlast. Shade sails are the perfect way to create a stylish spot to relax and enjoy the sunshine, without the harsh effects of UV rays or unpredictable heat. It allows you to control the comfort of your deck, patio, garden or entertaining area, making it a relaxing place to spend your time or watch the kids play. Choose from a large range of high quality and long-lasting practical & waterproof options for a style that brings the best out of your home. 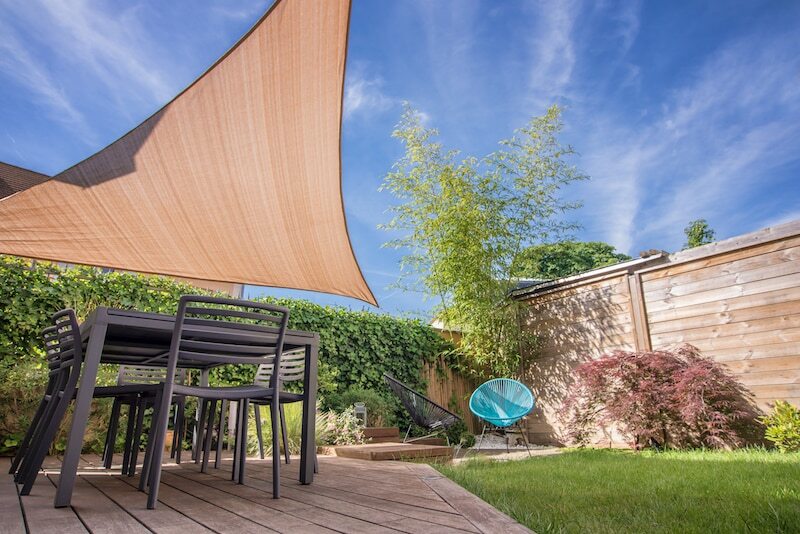 An outdoor shade sail or a tension membrane can provide elegant and cost-effective shelter from the elements, or if it’s privacy you’re after, a privacy screen is a smart choice to ensure your outdoor area can be enjoyed in peace. Our sails are built to last under the harsh Australian climate, and come with a warranty for guaranteed quality. Ask our highly skilled landscapers how a shade sail can enhance your home, and benefit from our knowledge and expertise. Or, come in and tell us what you want, and Everlast can get it install it for you so you can sit back and relax faster. Visit our showroom and speak to our landscapers today, and you’ll be relaxing with your favourite mag and a cool drink in your summer oasis in no time. Everlast has been a family owned company for over 20 years, so we know how to make Melbourne gardens shine. Our landscaping experts are always here to give you the right advice and know-how to get that next project right. We always source top quality shade materials, to ensure strong and durable products every time. We manufacture products right here in Hoppers Crossing at our own factory in Melbourne, so we know what quality should be. Our team is made up of highly qualified and experienced landscapers and tradesmen. With Everlast, you’ll always get the best workmanship and service in the land – that’s a promise. We do more than shade sails. You can trust us for concreting, decking, fencing and more, and you’ll only be dealing with one company. That means better savings, and support you can count on.